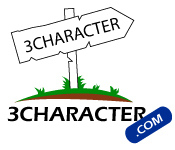 Check out The One & Only "3Character.com Price Guide"
Short domain names are all the rage, but this is really nothing new. They've stood as the gold standard of online real estate for over 15 years and while their supply is limited by the number of letters in the alphabet and their length in numbers, their demand keeps increasing. Beginning in 2005, 3Character.com began publishing our online price guide (the first of its kind) for short domains and today it remains a favorite go-to reference for all things short domaining. LLL.com & NNN.com Domains are RED HOT in 2015! As we make our way through 2015, the market for 3 letter (LLL) and 3 number (NNN) .com domains is on fire. Whereas valuations from about 2007 through 2012 were fairly steady with only minor increases, in the last 3 years the buyer demand for these domains has intensified. For much of the 3 character history of the web, the majority of the demand for these domains was found in the United States and other English speaking parts of the word. Now, however, a new player has emerged. The Chinese domain market absolutely loves short domains. Numeric domains are at an incredible premium, and 3 letter domains are gaining momentum at incredible speed. Along with this interest, we're starting to see the re-writing of the prior rules on letter quality. Letters like Q, Z, J, Y that were once not of great value are prime letters in China. Now it can be said that there probably aren't really any "bad" letters, or for that matter, any bad numbers. All have their possibilities across what is now a truly global 3 character domain marketplace. The valuations for NNN.com & LLL.com domains are rising fast. Most believe a new global valuation floor has been set and gone are the days of LLL.com's under five figures and LLL.com & NNN.com domains are soaring toward 6 figures.